Take your old worksheets, slide shows, and web quests and add a twist of Google to make creative, collaborative, and engaging lessons! On March 23, 2010, CSU Chico was inducted into the Wimba Hall of Fame at Wimba’s annual conference held in Orlando, Florida. CSU Chico was one of five universities recognized for exemplary innovation, creativity, and collaboration with the Wimba Collaboration Suite, which is software used for distance education and lecture capture. CSU, Chico was selected for this honor as a result of the distinctively creative and high-quality work of its faculty members who teach distance education classes. Professors Chunyan Song, Cris Guenter, and Asa Mittman are three of the many educators who integrate this form of technology into their instruction and who received special mention from Wimba. Chunyan Song, a professor of Sociology, was recognized for her use of technology to bring in textbook author Savo Helata to speak to her students about his experiences with genocide in Bosnia. The experience was so moving that the students initiated several action plans for positive change across the world. Dr. Song has spoken at numerous events both on and off campus to relate this story to others. Cris Guenter, a professor in the Department of Education, was recognized for her long standing use of Wimba software with her graduate students. Throughout her courses Dr. Guenter exposes her students to many types of technology, however the Wimba products continue to be the foundation for their exploration. Asa Mittman, a professor in the Art and Art History department, uses Wimba podcasting in his recently redesigned Art 100 course. During this course Dr. Mittman asks his students to create a podcast that explores local art in Chico and beyond. The students post their podcasts on the Internet and as of this date over 5,000 hits on the California Arts Podcast has led art lovers from around the state to discover and learn about structures, paintings and statues. The trophy was recently delivered to the Technology and Learning Program during a luncheon sponsored by Wimba. Faculty, staff and administrators joined in to celebrate via a distance conference with Wimba representative, Matt Wasowski, during which he congratulated Chico for collaborative improvements and innovations with distance learning tools and pedagogy during the last ten years. The trophy is now being displayed in the Academic Technology Department central office. Feel free to congratulate the many faculty who continue to engage their students from a distance and represent CSU, Chico with a spirit of excellence in education. Recently Eddie Vela, Associate Dean of the College of Behavioral and Social Sciences, presented a session about constructing an assessment piece for newly redesigned courses. Dr. Vela who is also operating as the Academy eLearning Assessment Coordinator, outlines some important ideas and methods for adding an assessment component. His invaluable insight to this topic makes this particular TILT session important to watch if redesigning a course. No password is needed to watch this archive. Type a user name into the participant area and enter the presentation. It should be easy to move files saved on your computer to the cloud, so we made our document upload feature much stronger. Imported documents keep their original structure more accurately, so you can spend less time adjusting files you move to the cloud. Documents support better formatting options like a margin ruler, better numbering and bullets, and more flexible image placement. Spreadsheets now have a familiar formula editing bar, cell auto-complete, drag-and-drop columns and more. The applications support up to 50 simultaneous editors, and documents let you see other people’s changes character-by-character as they type. Finally, we’ve added multi-user editing to drawings too, so now you can build flow charts, schematics, and other kinds of diagrams collaboratively. We’ve been providing Google Docs workshops and consultation for the last year to Chico State faculty and see great potential in the collaboration feature, but now the ability for multiple users to edit a document at the same time just got much, much better. See what your classmates, students or colleagues are typing in real-time, see their cursor color-coded, and have a chat about your edits on the side of the document! To enable these features in new documents you create with your Chico State Google account, watch my quick screencast. These features were once part of a product called EtherPad which Google purchased, and now we’re starting to see the fruits of that acquisition. Happy editing! When I first saw Wordle I was fascinated. I introduced that tool to many people, all of whom seemed to love it as much as I did. 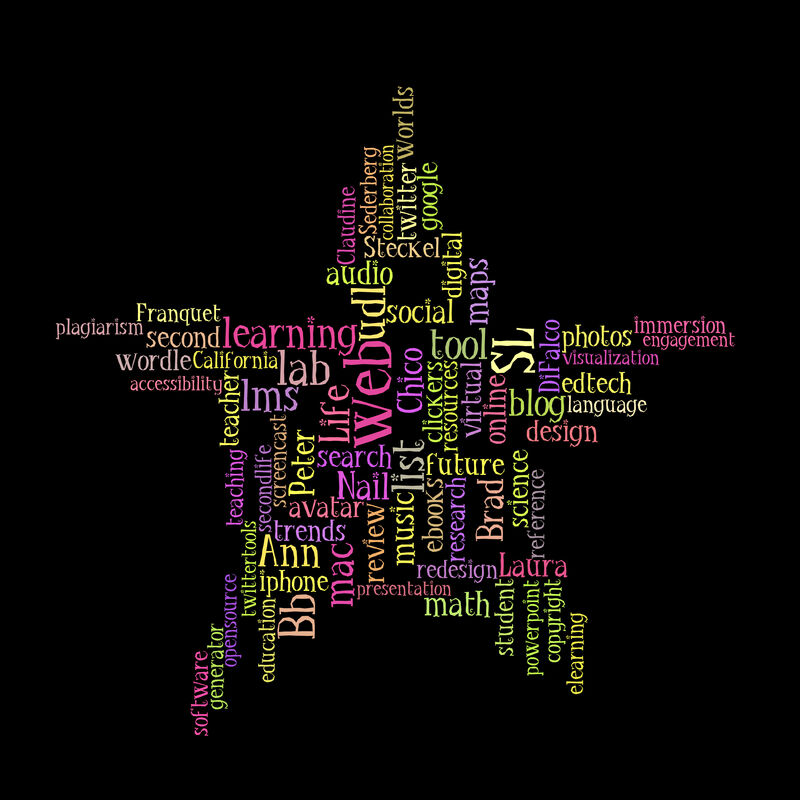 Now there is a Wordle-esque program that takes tag cloud visualization even further. This tool is called Tagxedo and can be found at http://www.tagxedo.com/. While there check out the library of previously created visuals and then try one of your own. Technology in Wimba can be a convenient and inexpensive tool to bring in guest speakers to maximize student engagement and learning experience. One Chico instructor brought in two guest speakers whose lectures on Yugoslavia had added invaluable elements to the course. Both lectures could not have been arranged without the technology of Wimba Classroom. Dr. Kate Tranchel, who is a professor at Chico State came in person. Dr. Tranchel had to teach another class the same time as the guest lecture. To solve the conflict, Dr. Tranchel brought in her students who watched the live broadcasting of the lecture through Wimba in a different room. The second guest speaker was Mr. Savo Heleta who is the author of one of the required textbooks in the same course, Not My Turn to Die: Memoirs of a Broken Childhood in Bosnia. Through Wimba Classroom, Mr. Heleta gave a lecture to the students and answered their questions all the way from South Africa. Many students indicated that the two lectures were among the most unforgettable moments during their whole college education. Students’ interest and involvement in the course had been greatly enhanced after talking with the book author. How are you using collaborative technologies to support your critical initiatives? Thousands of universities and community colleges from around the world rely on the Wimba Collaborative Suite to address the multifaceted challenges and opportunities within education today. Moving well beyond webcasting, Wimba’s proven, comprehensive, and easy-to-use platform combines interactive technologies that empower learning communities with a unique collaborative environment that improves student retention. Tuesday April 13 to Thursday April 15, the staff of TLP are virtually attending the annual conference of CATS, the Community of Academic Technology Staff in MLIB 002 – all are invited. CATS is a California State University-based group of instructional designers, It professionals, lab managers, assistive technology experts and many other members of each campus’s technology groups. You can view the CATS 2010 conference program online. TLP’s own Ann Steckel presenting in the Pecha Kucha style about Chico State’s work in Second Life; you can view her slides online and attend the discussion / campus tour in Second Life at our virtual campus at 3:30pm. Kathy Fernandes, Chico’s Director of Academic Technology, also presented this morning on her work for the Chancellor’s Office coordinating Learning Management System usage by campuses. There are many more sessions which we’ll be showing in our training lab (MLIB 002) on the big screen, so drop down to TLP between 9:00 and 4:30 today, Wednesday and Thursday to check out a session. You can also read or join the conversation on twitter using the #CATS2010 hash tag.